The best letter to start teaching your child the alphabet is the letter that begins his name. Young children are interested in things that relates to them. But when you start teaching his initial, you start to teach in capital letters. Most parents do this. Once they start teaching capitals letters, they continue to do so. Capital letters are easy for children to remember and write because they are made up mainly of straight lines. But it is harder for children to switch over to writing in lower case when they've learnt the capitals. I've written on the pitfalls of teaching capital letters first here. To solve this problem, you can start to teach your child the letters that are the same or similar in both lower and upper case. There is an order of the letters that should be taught to children such as s, a, n, t, i, p and so on. Research has found that teaching in this order makes it easier for children to remember. This is for children who are ready to learn letters and sounds (phonics). This is around the age of three and a half to four years. But for younger children, around three years of age, you can begin to introduce the letters. first start with their initial then continue with letters that have the same or similar shape in both capital and lower case such as c, j, k, o, p, s, x and z (this can include u, v, w, y depending on the font that your state uses). Today, I start with the letter c. As you can see the letter c is the same whether in capital or lower case. Start by using a flashcard of the letter and introducing it. You can teach both the letter name and sound at the same time. You can say, "This is the letter c and it makes the sound 'k'" The next time you say the letter c also make the sound after it so that your child will immediately associate the letter name with the sound. 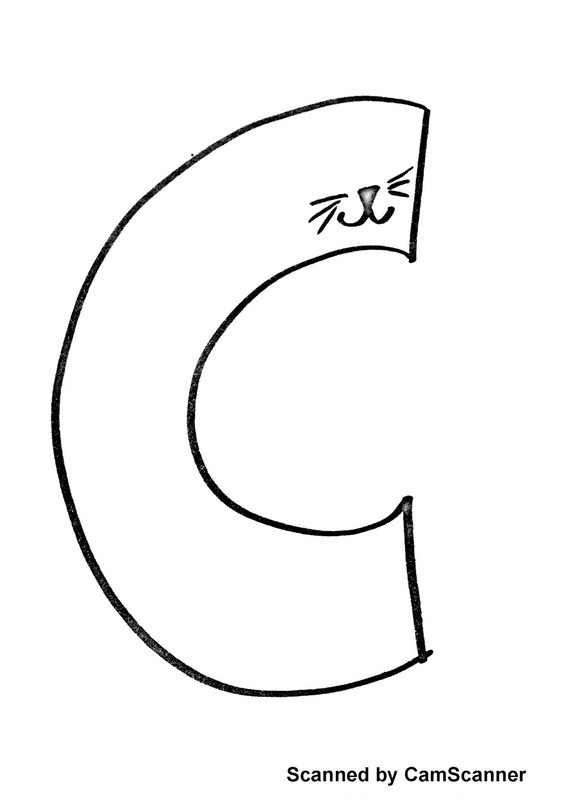 "This is c 'k'"
Next, to help develop your child's pencil grip, you can have your child trace the letter c. For some children who have not held a writing implement then this will be hard but with practice it gets easier. Guide your child's hand to show how it's written. Some children will start at the bottom and go up so it's important to show how to correctly do it. You can download my free letter tracing booklet here. It contains the whole alphabet to trace, one letter per page. 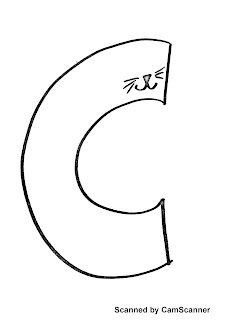 Select and print the letter c for this activity. After you've guided your child, you can let him do it by himself. It's perfectly alright if he starts to scribble as he is developing his fine motor control. If this is the case then give him plenty of practice with using markers and colour pencils on a blank sheet. Then finally, you can have your child do the craft below. 1. Download the free printable sheet here.and print. 2. Colour in the letter c.
4. Glue on the 2 triangles for the ears and glue on the 2 googly eyes. 5. Tape on the piece of string for the tail. Let your child play with it and every once in a while remind your child that this is the letter c. Download the letter c now.